Thank you for coming to AAR! I wasn’t able to attend your panels, but I was pleased to see you were there. I had some other interactions with people involved in the Applied Religious Studies track (who I think invited you) and was *really* pleased at this new focus on helping us grad students envision good and intellectually fulfilling lives outside the TT. As best I can remember, it simply didn’t exist at the last AAR I attended (2015). There are many, many more people in religious studies who would benefit from hearing you (including tenured folks who can’t understand why their advisees would seek out other opportunities), and I hope you come back. Thank you! I hope to come back, and let the organizers know! Just to let you know, it’s my understanding that 2015 was the year the AAR decided to take more active measures to see what they could do with regard to contingency, and first formed a contingency working group to examine these issues and promote sessions at the annual meeting. I am glad to see that it seems to be making a difference in conversations with NTT and TT faculty alike at the AAR. And Karen – thanks for coming! Fellow archeologist here… My anecdata says that a lot of folks are abandoning the SAAs too although for different reasons. And archaeology has long had a different relationship with CRM and govt non-ac archaeology. And PhDs are still over-produced. Tough times for the old 4-field religion. Karen, I am Laurie Patton, the incoming president of the AAR to whom you kindly referred. There is so much more to be done around the changing shape of the profession, and what we need to do as an academy to support contingent faculty and, as you say in your essay, acknowledge the pain that our current system creates. I’d love a chance to talk about that with you. Thank you for your essay. Thank you for coming to the AAR! I was so impressed at how practical your workshop was and was disappointed more people didn’t show up for the workshop. 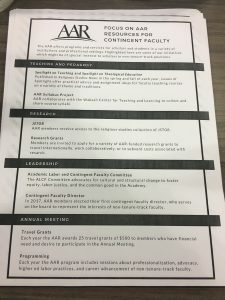 AAR, for sure, has its fault but I think the current team is really dedicated to supporting more contingent faculty and changing based on needs of the job market. I also attended the MeToo panel which was also poorly attended. I think they are aiming to make some changes there as well and I am hopeful. So interesting to read this accounting of contrasting cultures. Might it be possible that anthro has now become so strong a institutionalized “discipline” that its practitioners refuse to countenance anyone rejecting its academic spaces? I can think the AAR people are not as sure? Sorry for the delay in responding to this; I think it’s a very interesting theory. I must say as an anthropologist, who always really loved what I saw as the countercultural spark of the field, I am profoundly disappointed and disillusioned by this current stance. I hope you come to the SFAA meetings in the spring! There are some of us (anthropologists that is) who aren’t broken like those who attend the AAA meetings. I will come anywhere that I’m invited (and that works schedule-wise). I haven’t been invited to the SFAA yet! I am an scholar of African Religions, Ph.D. Virginia 2007, who has always been an adjunct (with many tales of injustice to tell), and who is about to give up and go teach secondary school in some form. I didn’t have enough money to fly to Denver for this AAR, but I did present a paper last year in Boston. Is there some way, Dr. Kelsky, for me to access your and others’ presentations about work outside of academia? Thanks for helping! 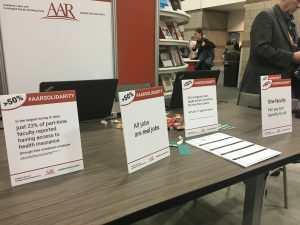 Kara, the AAR recorded many of this year’s Applied Religious Studies sessions, including the panel session featuring career services professionals discussing non-academic paths (the first session Dr. Kelsky describes participating in at AAR). Those will be available in the coming weeks/months as podcasts via iTunes and the AAR’s Soundcloud channel (https://soundcloud.com/rsn-aar). You can also check out many of our sessions from the 2016 and 2017 annual meetings, including last year’s session with career services professionals. I’d contest the notion that some “ethical” orientation accounts for the difference. 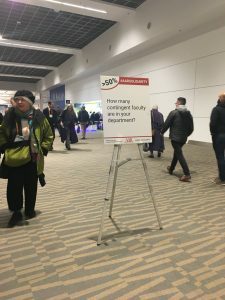 Whatever is going on in the AAA, in the leadership of the AAR today we see the results of a relatively small number of active contingent/former contingent faculty, who, over the past several years, have consistently pressed the org to take some action. And that action took time to develop. To be frank, though, this strikes me as not being a professional org issue—while they can assist individuals it seems to me that Chairs, Grad Director’s, and faculty can have structural effect and So I look forward to the day when programs across the country start to rethink the various futures for which they’re training their grad students. I wish I had known you were at the AAAs. I would have done my best to go to your session. I have been to 2 other AAAs (4 & 7 years ago), and this one had a different feeling about it – I think less people were there, and in particular less adjuncts and postacs, and a very eery smokey sky. I am curious if you attend SfAAs and how you are accepted there. I’m glad to hear it, Ed. Is there any way to search the schedule/app so that all of these show up under a single heading, so that the job seeker can target their conference time? in other words, are these collected together under a “Careers” (or some other term) heading? Because, if not, they will not be locatable to the vast majority, and will remain known only to silo-ed sets of members (ie, the middle east section, or the ABA, etc. etc.). What I found effective in the AAR conference was the way that all careers-related content was highly promoted, and also searchable using a single term in their scheudule and app. I have attended AAA meetings fairly regularly since 1988 (the first decade was as a student long before I had a job). A lot of things have improved since I was a student attendee, but my recollections as a Canadian was that despite the overwhelming size of the meetings I met many people who would engage with my work and interests and who were willing to engage with me – from luminaires to other students. I wasn’t at this particular meeting (being instead at an International Indigenous Research Conference elsewhere) so perhaps this meeting was differnt. I don’t know, but Ed’s comments do point out some of the things that are being done and as a member of the organizing committee for the joint CASCA/AAA meeting in Vancouver in 2019 I now that many things to make this large giant meeting accessible are being planned. It is always an unhappy feeling to arrive at a meeting and feel unwelcome and dismissed and in such circumstances to feel that that is an accurate reflection of all the other individuals organizing and attending. One of the ways that many of us navigate the AAA meetings is through membership in and involvement in one of the many sections of the AAA. For many years I participated with the Society for the Anthropology of Work – this is a group that keeps membership fees low, provides travel awards for graduate students, post doc and contingent faculty, and a warm and inviting and concerned environment that has often focussed on alternative to academic job tracks and support for contingent faculty. Charles, I appreciate your comment, but a) you weren’t at the meeting; b) you are a Full Professor. I don’t think you are in a position to speak for what is “warm and inviting” to contingent faculty. Just in case the AAA 2018 website is taken down, I would like to quote from the description of two of these panels, chosen semi-randomly. I did not look up the descriptions of any other panels. Oh my. Thank you for taking the time to inquire. To share these as “career” events is very dishonest (or delusional) indeed. The bad faith of AAA responses to the crisis of contingency seems to have not yet reached bottom. I was part of one of those 33 sessions that are listed (but not one for which Avery helpfully provided an abstract). We briefly touched on alt-ac, but it was certainly not the focus (intended or actual) of our panel. I find it a bit disingenuous to include it on a list of panels about alt-ac options. Thanks. I appreciate the fact-checking and truth-telling happening on this thread about the AAA. I don’t belong to AAA for the reasons you outline; however, I do belong to the Society for Ethnomusicology. While the society has its issues, we have foregrounded the ready possibility of becoming a public scholar at our conferences, with money and time dedicated to amplifying the voices of those who work outside the academy. It is important that academia rejects the conservatory model of creating mini-me players (producing thousands of violinists each year in a nation that has only 12 full-time symphony orchestras, for example), and recognize the powerful gifts that educated people can bring to EVERY workplace. Dr. Kelskey you hit it right on the nail… the AAAs are far from accessible or affordable for your target audience, and for those of us more in the margins of academia, bordering on postac, or are postac, the AAAs seemed like little more than a social gathering of job-secure academics and their self-congratulatory antics. As graduate students, when we could afford to go, career workshops provided no real insight and were mostly hackneyed reiterations on the dismal state of the job market. Advisors really didn’t prepare us for this reality. I ended up doing a resume consultation with your group, and although I was pleased with the product, I also realized I wasn’t in a position to land the industry jobs I was applying for. I joined the adjunct pool but I was lucky that it lead to something more permanent eventually. Unfortunately, Karen, you discovered the hard way that the AAAs are – and have always been – an insider’s club for TT academics and them alone. I’m so sorry you had that experience. I hope the SAA (Society for American Archaeology) invites you. Although another poster above said that people have been sloughing off of that in recent years – which from my personal data point of 2 seems likely, as my household hasn’t been since 2008 due to adjuncts and alt-acs having zero professional development funds – that would, I suspect, be a big draw and much more welcoming. Thank you for your essay. I have a short question: does this conversation change at all if the PhD student isn’t going into debt/doesn’t have debt? The stipend is meager yes, but the financial stakes seems lower if a student isn’t taking out loans. 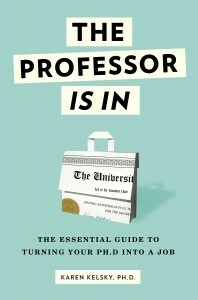 Would you urge a student to get out of academia even if they are not taking on debt? Thanks again.